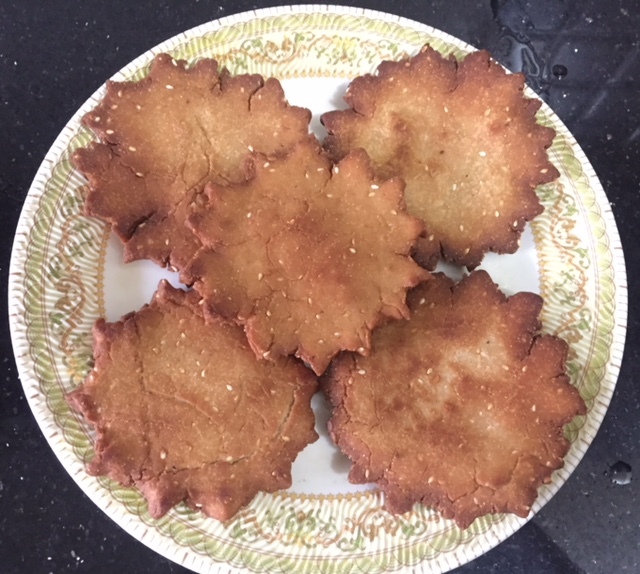 Mithyun Tikkyun are deep fried sweet flat breads made specially for Sataein / Thadri. You can use only maida or mix wheat flour in any proportion you like. Even the shapes also vary.. some prefer round while some cut into quarters. These days using the cookie cutters you can even make a fany shape. I have made the Traditional shape which is round with the pinched edges. Add the sugar with luke warm water and mix it well until it melts. 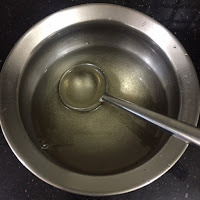 You can also soak it for few hours and keep mixing it a few times in between. 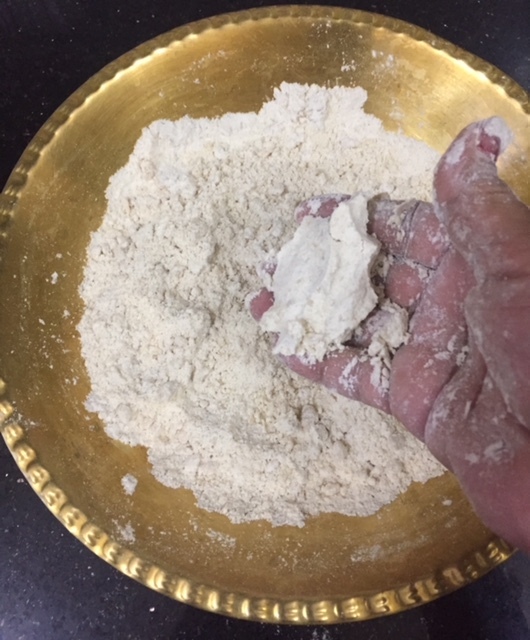 Now take the maida, wheat flour and semolina. Add the sesame seeds and cardamom powder. 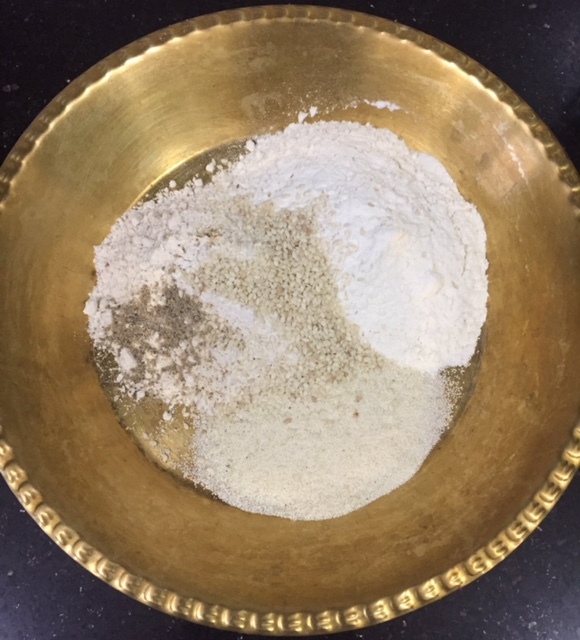 Mix together and make a well. Add melted ghee. Mix until it resembles crumbs. 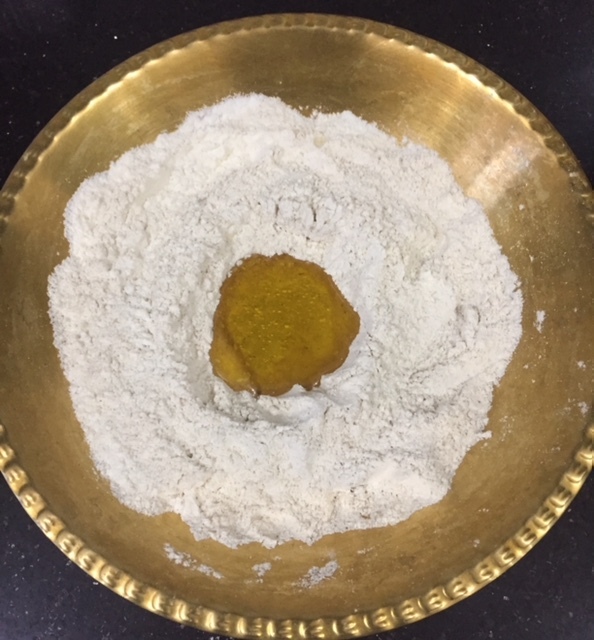 It should form a lump when pressed in your palm which means the ghee is sufficient. Now add the sugar syrup little by little and make a stiff dough. Use only as much is required. Heat oil. 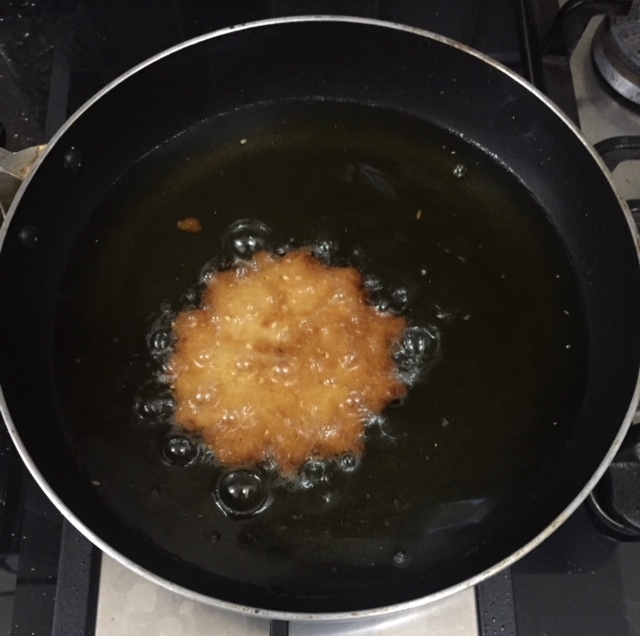 Lower the flame and deep fry the tikkyun until crisp and golden brown in colour flipping them carefully a couple of times to fry evenly. Remove them in a plate and let them cool down before boxing them. These fried bites look so tempting... delicious! Glad you liked my traditional Sindhi dish Archana. I have tasted this sweet Munchies long back in my friends house, still remember the taste, your recipe sounds similar, have to try for sure, thanks for sharing it. Thanks Soma.. then you must make them to see if they are same. Oh my gosh, these are my favourite, my mum used to make it on Satam. I must make for my children. Kids will love to see the traditional Indian recipes.Thanks Jagruti. Thanks dear .. I am sure they will like them. These fried munchies sounds like a irresistible and perfect dish to enjoy on Diwali. I like how you have shaped them. This is a traditional recipe made for a ritual Geeta.. These are something different, I remember I had in a friends house. I must try sometime. Do make them Jayashree.. they are very easy to make. 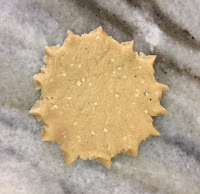 Wow sweet looks absolutely delicious and unique shape . Perfect sweet for the coming festivals. 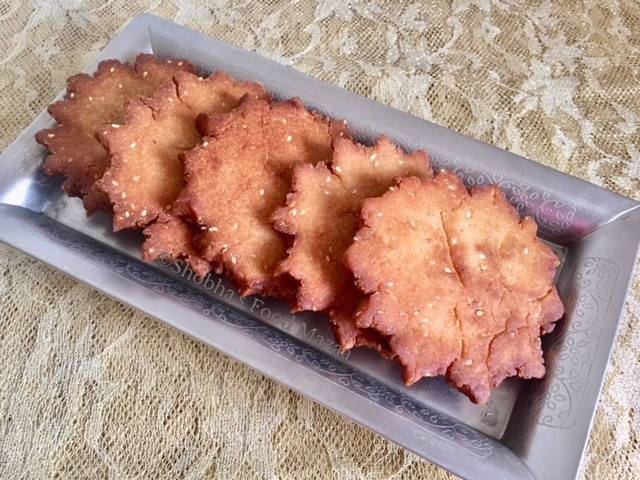 These sweet fried treats are perfect tea time accompaniments ..lovely share di ! Such a lovely and cute shape first of all. Really these are looking so healthy and yumm !!! Delicious flatbreads that look so yummy and crunchy! will try your recipe soon, thanks for the share. 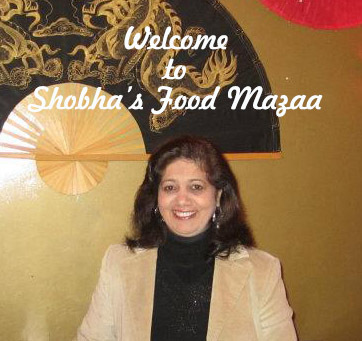 Thanks for liking and wanting to try them Meghna. Delightful share!! So apt for Diwali. Will definitely try this beautiful and easy recipe. Thanks for sharing dear. Thanks Shalu.. Make and enjoy. Perfect share for the festive season! These crunchy cuties must taste amazing with a hot cup of chai! A perfect recipe for the festivals. Love how traditionally people were innovative in using their hands to create pretty patterns.